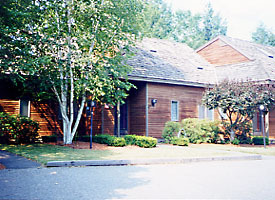 Deere Run – a Quechee Lakes rental property from Carefree Quechee Vacations. Consider a Quechee Lakes VT vacation. This fabulous, private community in central Vermont is an ideal way to experience the laid back Vermont lifestyle. In addition to its private amenities, fine dining, theater and shopping are nearby in the historic villages of Woodstock, Quechee, Norwich and nearby Hanover, NH. It’s easy to get to Quechee Lakes. The community is an easy two-hour drive from Boston, about four hours by car from NYC or a short flight from New York’s LaGuardia International Airport. Winter sports at Quechee Lakes include snowboarding, cross-country and downhill skiing, sledding, ice skating, and snowshoeing. The exclusive Quechee Club is the perfect place to meet friends. There is a well-equipped fitness center to help you stay in shape and two private 18-hole championship golf courses crafted by Geoffrey Cornish. The Vermont rental agencies below have considerable experience and will help you plan your Quechee Lakes vacation escape. Ask us about Quechee VT Vacations or share your Vermont lodging reviews. To feature your Vermont hospitality business, contact us. Quechee Lakes is now owned by an affiliate of Taurus Investment Holdings, LLC of Boston, Massachusetts, an international real estate company.